One of my secrets for creating truly unique and eclectic spaces is incorporating lots of thrifting finds! Peddler's Mall Stores are one of my favorite places to shop and they have locations all over Kentucky too! Every store is full of hundreds of different booths and perfect for treasure hunting (I've basically furnished and decorated the majority of my home from my Peddler's Mall finds). This week, they asked me to collaborate with them on a derby themed set-up. I headed to the Lexington location to look for items for my derby barcart and it did not dissapoint! I was able to find everything in the following photos (including the bar cart!) and after one hour of treasure hunting my derby bar cart was complete (without spending a ton of money too)! If you are decorating for a party or event on a budget, this is the place to go for the most unique finds! To start setting up your bar, you will first need a bar cart! You can also use a small table or any kind of cart or standing tray for this too! Next add a few vintage books or trays for layering and stacking. Then you will want to add a few little decorative touches: some equestrian decor and/or a small floral arrangement (roses are perfect for derby!). 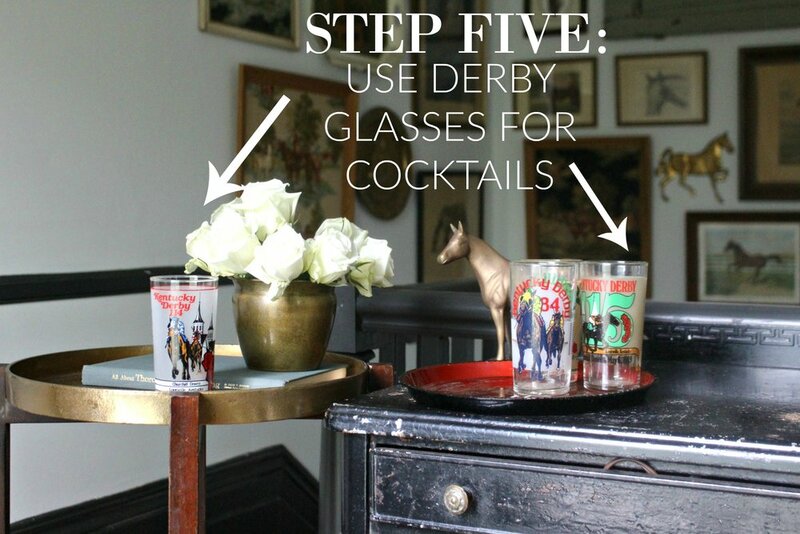 Fill your bar cart with plenty of vintage derby glasses- perfect for mixing and sipping all your cocktails and beverages. Finally finish with a few vintage decanters or pitchers for holding all your bourbon, mixers, and any other liquor. Check out my tutorial below for creating a chic Kentucky derby bar cart in just 6 steps!